Since 1985, McCabe’s Tree Experts has sought to provide New Jersey residents and businesses with the highest quality tree and landscaping services possible. We make it our mission to ensure that every tree we care for is as beautiful and healthy as possible. In all of our efforts, we place customer satisfaction as our highest priority. When you hire our New Jersey tree service company for your needs, our team will bring this dedication to excellence to task for you. 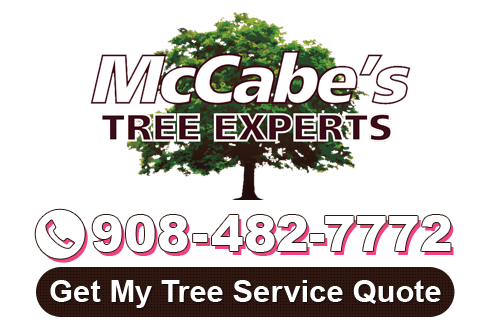 Call McCabe’s Tree Experts today if you need to hire a professional tree service and landscaping company in New Jersey. Our courteous and polite staff would be happy to take your call. Our knowledgeable experts can answer any questions that you may have about our skills and services. We can schedule your appointment today. In order to maintain the beauty and health of the trees on your property, your trees must be regularly trimmed and pruned. This task is far more difficult that it seems. When you hire our professionals for tasks such as tree trimming in New Jersey, you ensure that your trees and shrubs will be treated in the best possible manner. We can develop a maintenance schedule that will work best for you. You and your family will love the results. If there is a dead or unwanted tree on your property, it is hard for you and your family to enjoy your yard to the utmost. Not only are dead trees and stumps unsightly, but they can also present a significant safety hazard. Attempting to remove these trees and stumps on your own can be immensely difficult and extremely dangerous. When you hire our professionals for tree or stump removal in New Jersey, your unwanted trees and stumps will be removed quickly, easily, and safely. Severe weather can present a significant problem to trees and your landscaping. If you have had a tree fall over or a large branch or limb fall on your property, it is important to act quickly to resolve the problem. Our New Jersey tree service contractors can help you in any emergency. We can potentially cable, brace, and straighten a fallen tree. Likewise, our skilled professionals can remove dead and fallen branches for your property. At McCabe’s Tree Experts, our New Jersey tree service company understands how important your trees and landscaping are to your home, your business, and your family. We are honored by the fact that so many local residents and commercial property owners have trusted us over the years. In every project we undertake, our team strives to honor this trust by treating our services as if we are performing them on our own trees and for our own families. With this mindset, our New Jersey tree service contractors can always guarantee the best possible and most rewarding results. In addition to the exceptional tree services that we provide, our professionals are adept at a wide range of landscaping services in New Jersey. Our professionals can help you with recurring tasks such as mowing, feeding, and thatching your lawn. Likewise, we can conduct difficult efforts such as excavation and grading. All of our landscaping services will be completely customized to your unique needs and goals. If you have not been diligent in your landscaping responsibilities, it is likely that you need to clean up your yard and other portions of property. Our New Jersey landscaping crew can help you with this difficult project. We specialize in yard cleanups and property clearing services. After our efforts, all of your land will be ready to be put to the best possible use. From downed trees to season changes, we’ll have your lawn looking great again in no time! If you are looking for a New Jersey tree service expert, please call 908-482-7772 or complete our online request form.